The Jayden emanates pure sophistication and class with its multi-material make up. 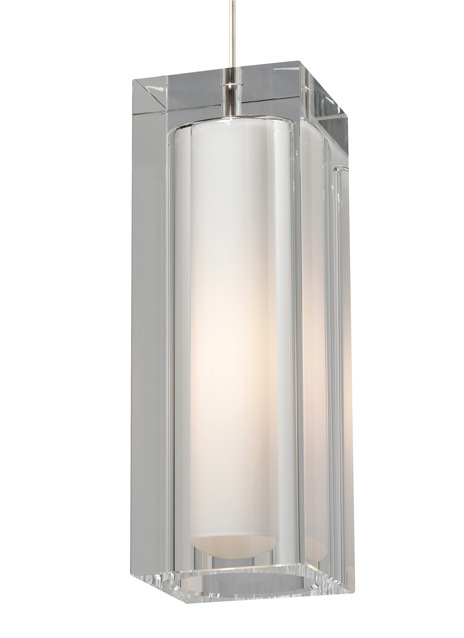 An outer block of solid crystal is formed into an elegant rectangular prism which surrounds a hand-blown inner white glass diffuser. With its 10.5” length and 3.7” diameter the Jayden Grande is ideal for kitchen island task lighting, bedroom lighting flanking two end tables and countless commercial lighting applications. Available lamping options include energy efficient LED or no-lamp, leaving you the option to light this fixture with your preferred lamping. The LED option is fully-dimmable to create the desired ambiance in you special space. Rated for (1) 60 watt max, E26 medium based lamp (Lamp Not Included). LED includes 120 volt 6.5 watt, 810 delivered lumen, 2700K, medium base LED BT15 lamp. Fixture is provided with six feet of field-cuttable cable. Dimmable with most LED compatible ELV and TRIAC dimmers.